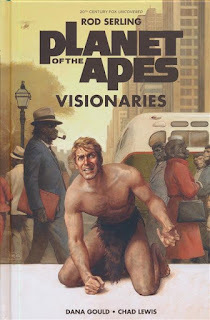 Rod Serling's movie treatment for Planet Of The Apes is the stuff of legend. It is set in a futuristic city like the book. 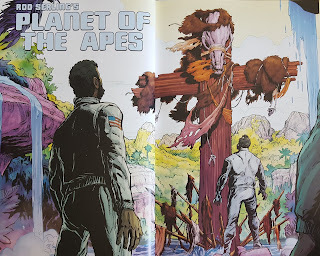 The scenario is very, very similar to the original movie, only with an Ape City which looks an awful lot like Manhattan, robbing the Statue Of Liberty ending of all of it's shock during the twist ending. The rest of the differences are subtle and the story plays out more like a 90 minute episode of The Twilight Zone. Serling did multiple swings at bat with his treatments, and this is sort of a hybrid of the later ones. The basic framework of the original film is largely unchanged. The Apes live in a society that appears to be the mid-1960s and are intelligent and civilized. Humans are primitive animals kept in cages. Elements of the original production art are utilized here. The original design of Doctor Zaius is used in this book. None of the wow moments in the original movie are present here. The writers who came in after Serling punched things up considerably. If the movie were made to this script it would have been successful but not as fondly remembered. It's easy to take the movie for granted today, but those special effects were cutting edge stuff for their time. This is a good read, but that's about it. It's not great. 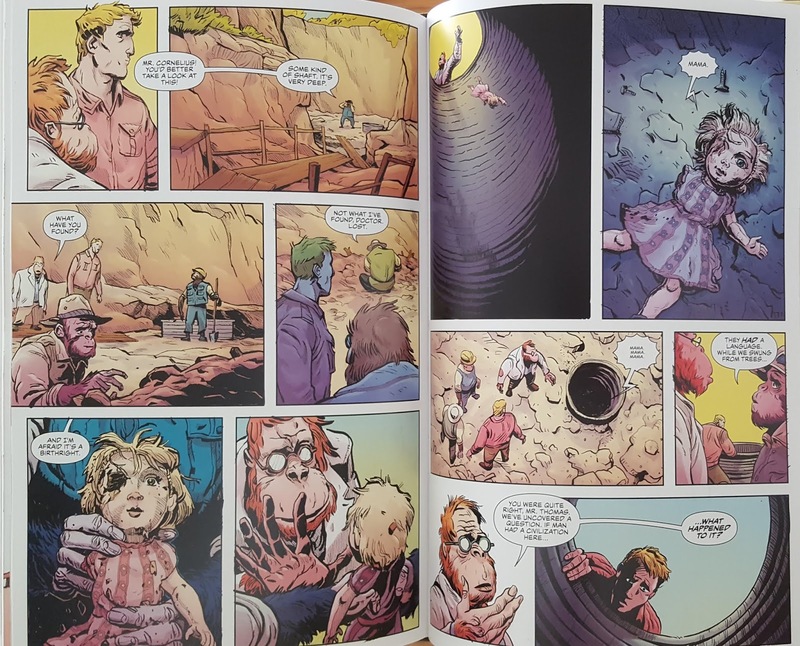 The artwork has a storyboard vibe to it, being left intentionally unpolished. I would have liked to see it spit shined to mid-60s photo realism perfection. I'm glad that this book was released, as Rod Serling's treatment deserves to be experienced after all of these years. 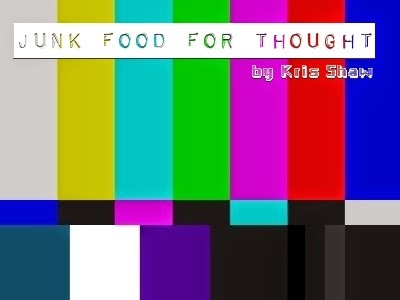 Junk Food For Thought rating: 4 out of 5. The OCD zone- This is the part where I go into tactile sensations and materials used in physical media. Those with heart conditions, high blood pressure, or women who are pregnant should exit my blog at their earliest convenience, as their safety cannot be guaranteed beyond this point. Paper stock: Semi-glossy coated stock. Hardback cover notes: Matte finish casewrap with no dustjacket. The spine is super squared, a trend that I will never understand. Looks great on the shelf, feels uncomfortable when you actually read the book.